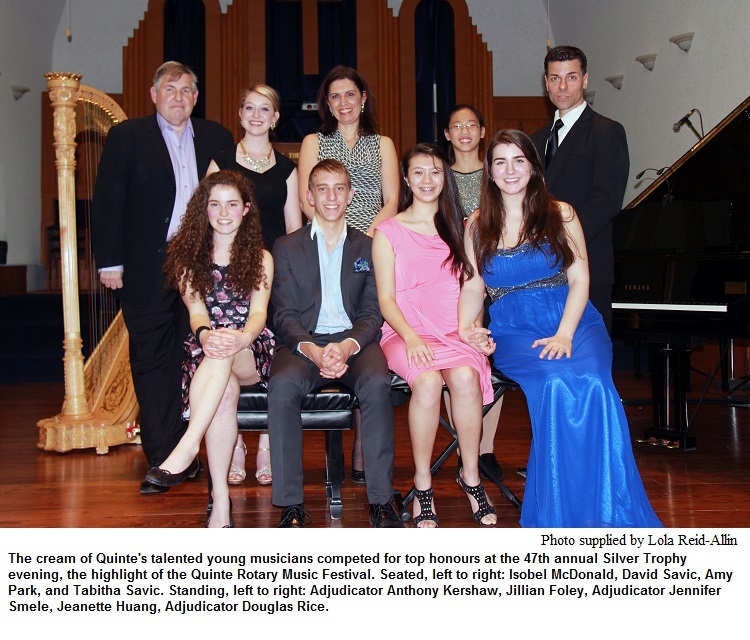 For the first time in the 47th-year history of the Quinte Rotary Music Festival, one performer has captured four major prizes at the event's Silver Trophy competition held April 17 in Belleville. Talented 16-year-old Tabitha Savic sang, played harp and piano to earn the festival's coveted Rose Bowl for voice, Silver Strings for strings and Silver Tray for piano, along with the Joe Demeza prize for best overall performance of the competition, which drew a crowd of close to 100 at St. Matthew's United Church. The panel of three adjudicators – Jennifer Smele (piano), Douglas Rice (voice) and Anthony Kershaw (bands, instrumental and choral) watched from the church's balcony as Savic and four other top vocal students competed for the Rose Bowl in the evening's first round of performances. An appreciative audience heard Amy Park (16) sing Schubert's Gretchen Am Spinnrade, followed by David Savic (15) with Per la Gloria by Bononcini. Next was Isobel McDonald, 16, with the entertaining I Hate Music song cycle by Bernstein, and Jillian Foley (18) performed The Sun Whose Rays are All Ablaze, by Gilbert and Sullivan. Rose Bowl winner Tabitha Savic ended the round with Mozart's Una donna a quindici anni. Competing for the Silver Strings trophy were 12-year-old Jeanette Huang, who performed a challenging violin Mazurka by Wieniawski, against Tabitha Savic's delicate Variations on a Theme by Mozart on the harp. Savic rounded out the evening as the lone competitor for the Silver Tray trophy for piano, performing the haunting Hommage by Canadian composer Maurice Dela. The Silver Pitcher, for woodwinds and brass, had no entrants this year and was therefore not awarded. The adjudicators, who heard more than 113 competitors perform over 300 music pieces during the week-long festival, had high praise for all of Friday's entrants, adding the Quinte area has an "impressive" amount of music talent. Each of the category winners in Friday's competition receive a 500-dollar cash prize, and the Joe Demeza prize is worth an additional $150. This year's festival, sponsored by the Belleville, Trenton and Sunrise Rotary clubs, was held at six Belleville venues: Bridge Street, St. Matthew's and Eastminster United churches, St. Thomas Anglican, The Salvation Army Church, and Albert College. Categories included voice, choral, piano, bands, strings, instrumental and, more recently, handbells. Festival chairman John Chisholm said the festival also relies on community support from sponsors, recognizing the generosity of this year's platinum level sponsor, Rotarian Rudy Heijdens, known to many for his tireless work as founder and director of the Hastings and Prince Edward Children's Chorus. This year's silver sponsor is Albert College. There is still time to take in some of the festival's top performers at the annual Concert of Stars, scheduled for April 29 at 7 p.m. at Albert College. Admission is free for this popular event, a showcase of the week's best performances, as well as presentation of the festival's major awards and cash prizes.